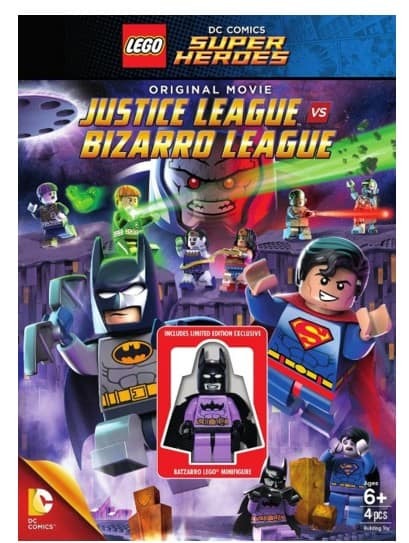 The LEGO: DC Comics Super Heroes: Justice League vs. Bizarro League is on sale right now for $6 at Amazon. That's 70% off the list price of $19.98! Wherever there is chaos and destruction, you will find Superman's mixed-up clone, Bizarro, who hears the opposite of what is said, says the opposite of what he means and does the opposite of what is right. The Man of Steel decides it's time to find a new home for him…on another planet, Bizarro World! When Bizarro World is threatened with destruction by the galactic tyrant, Darkseid, Bizarro returns to Earth and clones the Justice League to create more “heroes” like himself; the Bizarro League is born! From Batman, Wonder Woman, Green Lantern and Cyborg, backward clones are spawned called Batzarro, Bizarra, Greenzarro and Cyzarro. It's up to the Justice League to team up with their bizarre counterparts to stop Darkseid and save the galaxy! Bonus content includes Batman Be-Leaguered Animated TV Special and Bizarro Featurette!